A new breeding pair of beavers has been released into the wild in Scotland as part of a five-year reintroduction trial. The mammals were transported from a holding facility at the Highland Wildlife Park and released in the Knapdale area of Argyll. The move comes a year after 11 beavers were set free in the area. However, one of the animals was later found shot while two others went missing. Despite the setback, the remaining two families of beavers in the area have appeared to thrive in spite of the freezing winter. The trial, which is a partnership project between the Royal Zoological Society of Scotland (RZSS) and the Scottish Wildlife Trust (SWT), aims to determine how beavers will prosper in Scottish habitats and to assess their impact in the current Scottish environment. Prior to the release of the new breeding pair, two artificial lodges were created by the project team to provide temporary shelter until the animals can build a lodge of their own. Food and used bedding was also placed in the lodges to encourage the beavers to settle in the area. Roisin Campbell-Palmer, who is co-ordinating the project, said: "Whenever you release an animal into the wild it is a nerve-wracking moment and you want to give them the best chance at adapting to their new environment. "Knapdale is ideal for beavers and already we have seen our other animals really making it home and doing what comes naturally to them. "The two beavers are in good health, having passed all the required veterinary health checks and we are confident they should settle in well." The project could determine whether or not beavers are reintroduced into the wild across Scotland. About 25 European countries have already reintroduced the animals back into the wild. 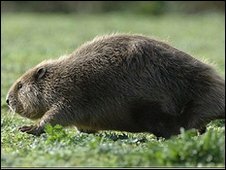 Beavers are a native species to the UK and were once a common sight before they were hunted to extinction by man. The mammals are known as a "keystone species" which bring benefits to wetland environments and improve habitats for other animals, including invertebrates, birds and otters.